A new study to be published in the Journal of the American Society of Nephrology (JASN) shows that applying ultrasound to the kidneys prior to a major operation, where blood flow to the kidneys is disrupted, may help preserve and protect the kidneys after blood flow is restored. It is believed that the ultrasound treatment stimulates an anti-inflammatory response that protects the kidneys. 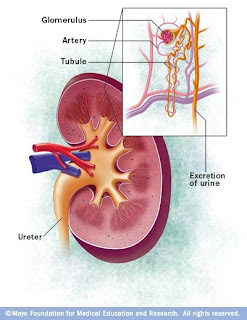 Acute Kidney Injury (AKI) happens when the kidneys are unable to filter waste products from the blood. This leads to a waste buildup in the blood which may reach to dangerous and even deadly levels. AKI, although reversible, can be fatal for critically ill patients. Patients who have undergone major surgery are prone to acute kidney injury because the kidneys are deprived of normal blood flow during the procedure. Ultrasound therapy have been in the forefront of non-invasive and drug free treatments for a host of conditions. Just recently, a study was published showing that ultrasound can also accelerate wound healing and tissue repair. Another development in the medical utilization of ultrasound is ultrasound surgery which is used as a non-invasive treatment of benign and malignant tumors. Ultrasound treatments may prevent acute kidney injury that commonly arises after major surgery, according to a study appearing in an upcoming issue of the Journal of the American Society of Nephrology (JASN). The findings suggest that this simple and noninvasive therapy may be an effective precaution for patients at risk. Acute kidney injury, an abrupt decline in kidney function, is an increasingly prevalent and potentially serious condition in hospitalized patients. Sometimes acute kidney injury arises after major surgery because the kidneys can be deprived of normal blood flow during the procedure. Once the injury develops, patients have few established treatment options besides supportive care. Mark Okusa, MD, Joseph Gigliotti, PhD (University of Virginia), and their colleagues found that a drug-free, noninvasive, ultrasound-based treatment could prevent acute kidney injury in mice. When they exposed anesthetized mice to ultrasound with a routine clinical imaging system 24 hours prior to blood disruption to the kidneys, the mice exhibited preserved kidney health after blood flow was restored. In contrast, sham-treated mice exhibited significant kidney injury. Further analyses revealed that the ultrasound treatment likely stimulated an anti-inflammatory response that originated from the spleen and was responsible for protecting the kidneys. "Our studies using noninvasive ultrasound now provide us with an active treatment that appears to be simple, effective, and nontoxic for the prevention of acute kidney injury," said Dr. Okusa. "To our knowledge this has never been described for the prevention of tissue or organ injury. Interestingly, we suspect that similar mechanisms that lead to kidney injury may also lead to lung, heart, and liver damage and that this form of therapy might be effective for prevention of injury in other organs as well." In an accompanying editorial, Alain Le Moine, MD, PhD (Erasme Hospital, in Belgium) and his colleagues noted that opportunities arising from the work are numerous and promising because many procedures that carry a very high risk of AKI are planned. "In searching for novel approaches to prevent and even cure AKI, we believe that splenic ultrasound stimulation has a bright future ahead," they wrote.